From January through December, let's take a look at what North Carolina has to offer this year. Mountain waters are alive with bass, crappie, trout and walleye. Piedmont lakes churn with largemouth and smallmouth, stripers, catfish, chain pickerel and crappie. Coastal waters teem with just about every species that swims. So mark those calendars and plan your vacation days around these fishing adventures. Surveys showed less than 10 percent of crappie were reaching the 8-inch minimum keeper size. Three years ago, the N.C. Wildlife Resources Commission’s surveys showed less than 10 percent of crappie were reaching the 8 inches, so it removed limits for them with the goal of increasing sizes of remaining crappie by reducing competition for forage. Anglers are catching much larger crappie, but in high numbers. In January, anglers should find fish at 12 to 20 feet, suspending in the shallower coves. The best bet is trolling jigs on long lines. However, if the fish are too deep for long line tactics, anglers will find that trolling jigs on tight lines works better. OTHER OPTIONS: Lake Tillery stripers will hit Zara Spooks cast where birds are working baitfish. 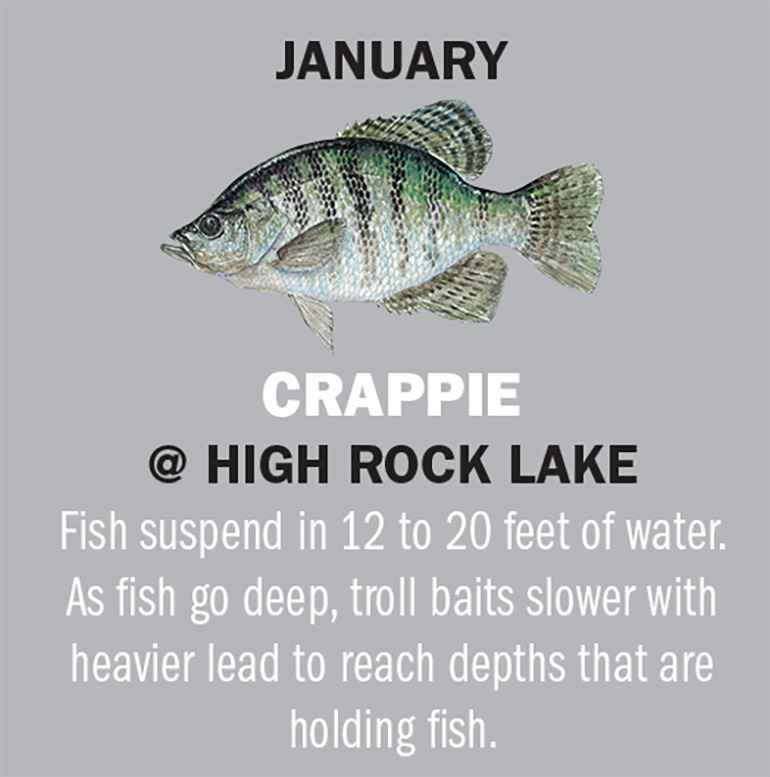 Crappie will eat minnows off of deep ledges in Harris Lake. 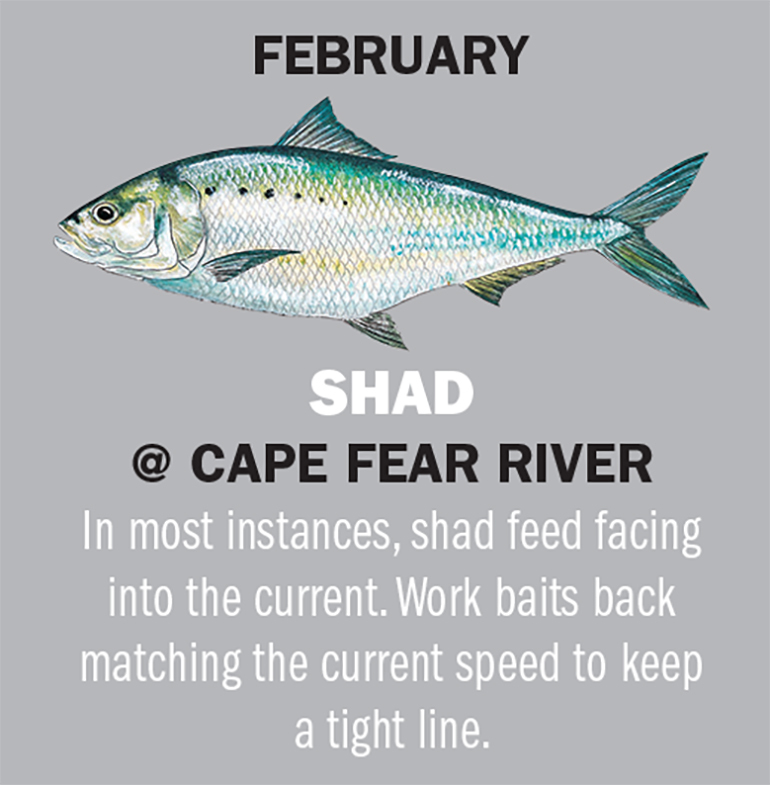 The Cape Fear shad run begins in February. High water and cold temperatures can dictate lower numbers of fish, but by the end of February, anglers will be catching plenty of American and hickory shad. Hickory shad are the smaller of the two species, but they have been increasing in numbers. The shad first reach Lock and Dam No. 1 at Riegelwood. Soon afterward, they reach Lock and Dam No. 2 at Elizabethtown. Fishing is good downstream of both dams and boat ramps are located at both. Anglers catch shad by anchoring just downstream of a dam and casting jigs with twisty tail trailers, darts and spoons. Studying the ripples and seams reveals where the fish are swirling and leaping. OTHER OPTIONS: Chain pickerel will chew Roadrunners at Mayo Lake. White perch will pound spoons in the Neuse River. Catching striped bass on the Roanoke River is one of the state’s premiere adventures. While anglers can catch 100 stripers a day, the rocky Roanoke is treacherous. The river above the N.C. 158 Bridge can ding a propeller, so anglers who do not know the river should fish below the Weldon ramp downstream of the bridge. Stripers strike nearly anything. Anglers easily catch them with shiners and other live baits. Fly-fishermen catch them on streamer flies. Anglers with spinning rigs should cast bucktail jigs with plastic trailers and stickbaits. Lures must have single, barbless hooks. Striper season runs March 1-April 30 unless NCDMF closes or extends it by proclamation. The limit is two per day, 18-inch minimum size, no fish between 22 and 27 inches and only one fish greater than 27 inches. OTHER OPTIONS: Crappie will bite live minnows at Lake Jordan. Bass will bust spinnerbaits at Lake Norman. Sutton Lake is a legendary place to catch largemouth bass. The lake is one of the warmest lakes in the state, so bass grow to impressive sizes. Decades ago, bass anglers asked for and received a prohibition against keeping bass Dec. 1- March 31, so April is a great time to catch a trophy. Anglers should fish the first three or four “ponds,” which are actually compartments created by a dike that increase the lake’s flow length. 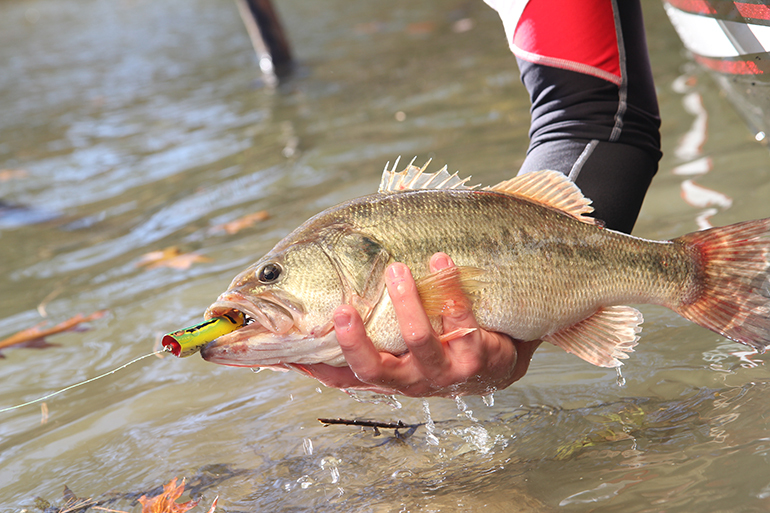 Anglers catch bass with jigs, soft plastics and crankbaits, casting to points, stumps, fallen trees and drop-offs. The lake is a “moody” lake, with varying conditions from year-to-year, so anglers have to be adaptive with their tactics. OTHER OPTIONS: Walleye will eat minnows at Fontana Lake. Schooling largemouth bass will smack spoons at Badin Lake. While 3,007-acre Randleman Lake opened in 2010, it still acts like a new lake, with largemouth bass attaining high relative weights. The lake has standing timber and fallen trees along the shoreline. It also has bridges, points, islands, humps, coves and creeks. In April, topwater action begins, with anglers casting propeller lures and walk-the-dog lures early and late. The fish also strike big soft plastics and jigs in the woody cover. Spinnerbaits and crankbaits bumped along rock outcrops are sure to elicit strikes. Anglers who do not have boats can rent canoes and jon boats at Guilford County Southwest Park or launch their own paddle craft to access the 507 acres at the north end of the lake where regulations prohibit powerboats. Anglers who have no boats will find the pier at the PTRWA ramp on the south end is a great place. OTHER OPTIONS: Fly-fishing will fire up for trophy brown trout on the Catawba River’s Special Waters. Smallmouth bass will tap tube jigs at Hiwassee Lake. After school is out, families head for the beaches and anglers should try catching king mackerel at an ocean pier. Kure Beach Fishing Pier is among the best because it is near the Cape Fear River, where its fertile waters attract the baitfish that king mackerel eat. Pier anglers use live baits to catch king mackerel. The best are bluefish, menhaden and pinfish. The rig is a trolley rig, which requires two rods. The anchor rod casts a sinker that holds in the sand. The fight rod holds the live bait. The bait is hooked on a rig with two or more treble hooks and it slides down the anchor rod’s line to the water. A release clip frees the line at the strike so the angler can fight the king. Other anglers gaff the fish to lift it to the pier deck. OTHER OPTIONS: Lake Lucas largemouth bass will bite topwater propeller lures. Blewett Falls Lake catfish willchomp shad fished in creek mouths. While muskellunge inhabit several rivers, water conditions can make boating daunting. Lake James is the better bet because anglers can fish from bass boats. While many bass anglers are shocked by muskie strikes, anglers who target muskellunge upsize lures their lures. A four-bladed, four-ounce spinnerbait or a stickbait that weighs half a pound is a run-of-the-mill muskie lure. Large baitcasting reels spooled with heavy braided lines with wire leaders are required gear for landing muskies consistently. The trick is to keep casting, waiting and watching. As the angler brings the lure alongside, rather than lifting it from the water immediately, he leads it in a figure-8, which can make a muskie think the lure is about to get away and draw a vicious attack just at the rod tip. It may take a day of fishing to draw one strike. Bridges, drop-offs and fallen timber in the water are places where muskellunge lurk. OTHER OPTIONS: Blue catfish will strike cut shad fished on the bottom at Lake Gaston. Stripers will strike bucktail jigs at Lake Rhodhiss. Tributaries to Albemarle Sound have some great sunfish action, with the Chowan River among the best. Anglers catch bluegill, redbreast, warmouth and redear sunfish along the banks. Anglers can catch sunfish with crickets, night crawlers, red worms and mealworms, dropping them on float rigs. Casting a beetle grub spinner is another sure bet. However, the most fun any angler can have is by catching them with a fly rod. Popping bugs work well at dawn and dusk. During the day, drifting a sponge-bodied ant or spider below a strike indicator is a better way to catch them. The trick is fishing near cover such as stumps and cypress trees. The fish lurk in the shade places when the sun is high. OTHER OPTIONS: Sunfish will also strike flies in the Roanoke, Pasquotank and Perquimans rivers. Sheepshead will nibble fiddler crabs at Swansboro bridges. The bridges and channels along the Atlantic Intracoastal Waterway at Morehead City hold some of the state’s biggest flounder. Anglers catch them by several methods. The best way to catch flounder is by anchoring the boat near hard structure such as a dock or seawall and casting a live mullet or menhaden hooked on a bottom rig. A flounder strike is usually just a tap or feeling of heavy weight on the line. The angler lets the flounder eat the bait for a minute before setting the hook. Another method is using a jig tipped with a live mullet or a soft plastic trailer. Jigs work best for deep structure such as bridge pilings. They also work well at near shore reefs. 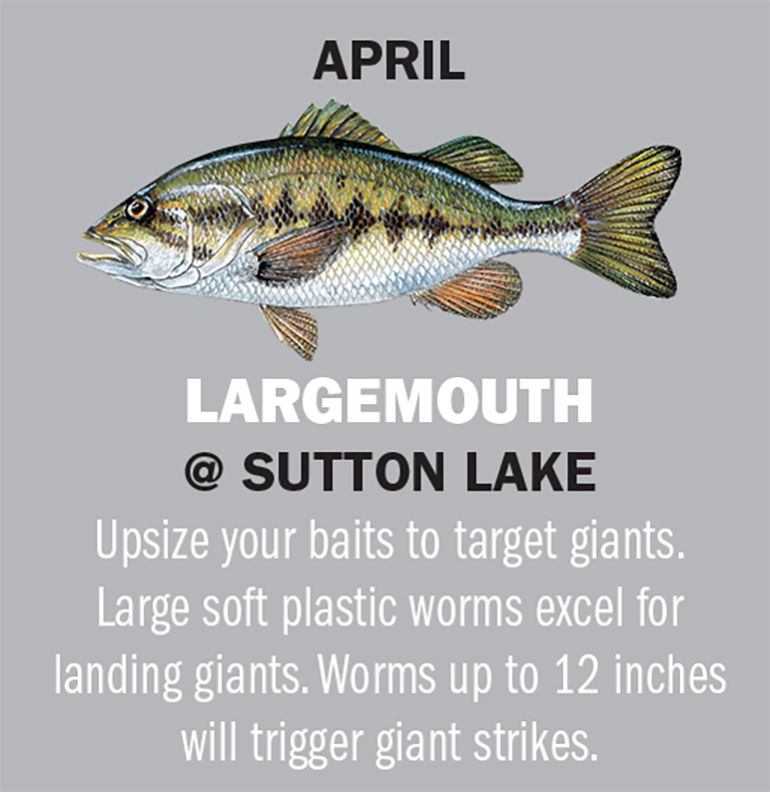 OTHER OPTIONS: Lake Santeetlah largemouth and smallmouth bass will strike soft plastics on drop-shot rigs. Trout will strike lures, baits and flies in the Nantahala River. When folks from the mountains head to the coast for spots, anglers from the coast flock to the mountains for trout. The creeks along the northern shoreline of Lake Fontana in Great Smoky Mountains National Park have superior fishing for brook, rainbow and brown trout in some gorgeous autumn scenery. Anglers can access Twenty-Mile, Eagle, Hazel, Forney and Noland Creek from their own boats or a ferry out of Fontana Village Resort Marina. While anglers can walk upstream to fish, the fish also congregate in the stream mouths, where they eat live minnows, lures and flies in the undesignated water. However, inside the park, anglers must use lures and flies with a single hook and comply with other park regulations. Another superior trout fishing opportunity in the same area is the Cherokee Reservation. The reservation has catch-and-release fly-fishing as well as bait and lure fishing for stocked trout. OTHER OPTIONS: Red drum will strike chunk baits in the surf at Cape Hatteras. Spots will bite at ocean piers. In November, whiting school on flats along the Cape Fear River near Southport. Whiting is the term for three kingfish in North Carolina, including the Gulf, Southern and Northern Kingfish. The Gulf kingfish is gray, the southern kingfish is silvery with bronze bars and the northern kingfish is brown or bronze with dark bars. They all look and taste the same when cleaned, yielding delicious white fillets. Whiting are not choosy about what they eat. Fished on two-hook bottom rigs, shrimp, bloodworms and squid are go-to baits. Whiting are one of the smaller saltwater fish that are so abundant that they are not subject to catch limits. 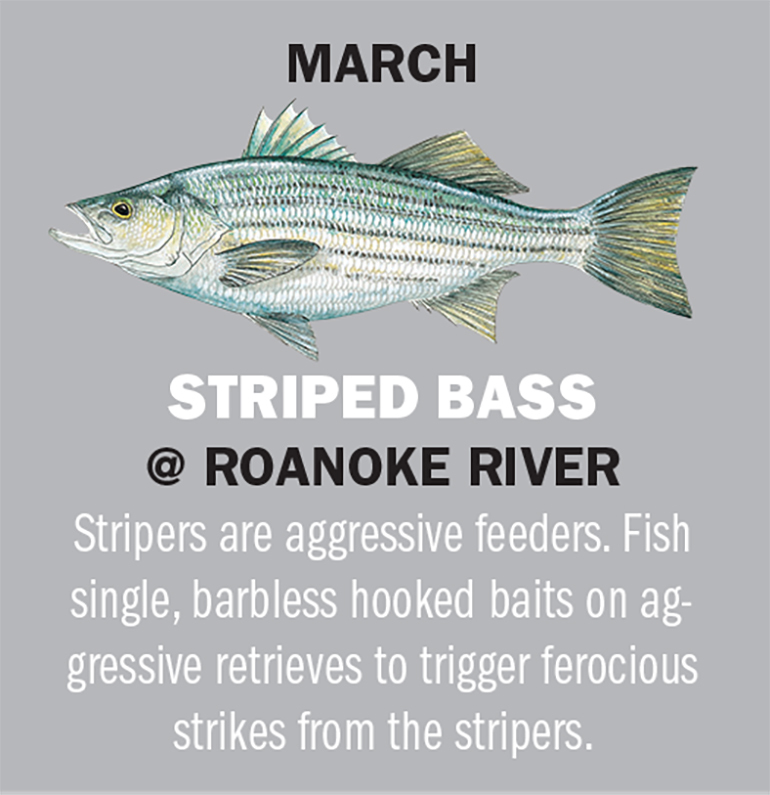 OTHER OPTIONS: Stripers will strike bucktail jigs at Lake Hickory. Blue catfish will crush shad chunks trolled along the bottom of Lake Wylie. When weather turns cold, speckled trout fishing turns hot and anglers head for the Neuse-Trent River to catch them. The fishing centers around New Bern, but the fishing for speckled trout can be good right into Pamlico Sound. Anglers can use bass tactics, casting jigs tipped with Berkley Gulp Shrimp or Haw River grubs, MirrOlure MR17 suspending twitchbaits and Zara Spooks as they cruise along the shoreline under trolling motor power. One of the best ways to catch specks is with a popping float rig. The rig consists of a foam float with a wire harness passing through. Plastic and metal beads at either end bang against the float when angler twitch the rod tip, imitating the sound of a flipping shrimp. A soft plastic shrimp on a leader below the float rises and falls and trout cannot resist the temptation. OTHER OPTIONS: Striped bass are suckers for live shad fished on planer boards at Kerr Lake. Crappie will strike minnows and jigs at Tar River Reservoir. Mike Marsh’s newest book, “Fishing North Carolina,” covers more than 100 lakes, rivers, ponds, sounds and piers. To order “Fishing North Carolina” ($26.60), “Inshore Angler – Carolina’s Small Boat Fishing Guide” ($26.20), and “Offshore Angler – Coastal Carolina’s Mackerel Boat Fishing Guide” ($22.25), mail a check or MO to Mike Marsh, 1502 Ebb Drive, Wilmington, NC 28409 or mikemarshoutdoors.com for credit card orders.